One of 500 dead penguins that washed up within a few days on a beach near Sao Paulo, Brazil in 2010. Oil exploration is common in the coastal areas around Sao Paulo. 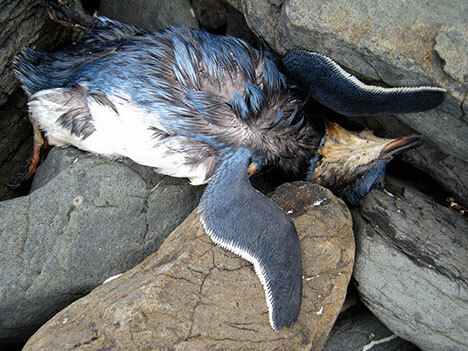 A Gisborne District Councillor is demanding a moratorium on seismic testing following revelations that scores of dead penguins are washing up on East Cape beaches and new international research suggests seismic testing is responsible for killing a range of sea creatures. “Evidence is piling up on the impact of the seismic tests both here and abroad” said Mr Caddie, who as a member of the Environment & Policy Committee of Gisborne District Council argued that seismic testing should not be considered a permitted activity in the Gisborne District given the potential harm it can cause to sea life. Mr Caddie cited recently published research from researchers at the Technical University of Catalonia in Barcelona that found the deaths of giant squid, washed up on Spanish beaches in 2001 and 2003, were caused by nearby oil and gas seismic surveys. Environment and Conservation Organisations (ECO) of New Zealand said Spanish research into mass deaths of squid, cuttlefish and octopus showed organ damage in these creatures after just two hours exposure to low frequency noise from 50-400 hertz, or “acoustic smog”, due to oil and gas exploration and shipping. “The scientists found that the organ that allows squid, octopus and cuttlefish to regulate their positions to balance and direct how and where they swim was damaged leaving the animals unable to move or to feed and vulnerable to predators,” ECO co-chair Barry Weeber said. Mr Caddie said the activity of the Orient Explorer survey ship is putting all sea life is at risk with sonic booms from sonar gun arrays of up to 259dB firing into the sea floor. “Even the United States has stricter regulations on this activity than the New Zealand government. There is a federal register where the public have an opportunity to assess the proposed seismic testing activity. The applicant has to detail every piece of equipment to be used, with comprehensive information on the acoustic source specifications, the level of activity being undertaken and the estimated impacts on the marine environment. Mr Caddie said the level of government hypocrisy was reaching new heights given the pressure New Zealand put on Russia last year to stop oil and gas companies using seismic testing in whale migration and breeding areas. “DOC guidelines specifically identify from now until October as the time of year most likely to have negative impacts on whales as they migrate. The sounds from marine exploration surveys are one of several anthropogenic noise sources that have been identified as eliciting behavioural reactions in marine mammals. Seismic surveys rely on systems that produce impulsive, high intensity sounds (190–250 dB re 1 µPa, peak to peak), with most energy below 200 Hz. The peak frequencies of these sounds overlap the acoustic signals and estimated hearing ranges of baleen whales. Such acoustic interference could reduce a whale’s ability to detect biologically relevant signals. With the increase in oil and gas prospecting surveys into deeper waters, there is sparse knowledge on the acoustic responses of baleen whales to sounds from seismic exploration.